I don’t know what to do with myself, Squiders. The husband and the no-longer-that-small, mobile one have gone on a father/son sort of trip, so aside from some contract work (~4 hours worth) and taking care of the very small, nonmobile one, I have the whole weekend to myself. It’s been years since I’ve had so little responsibility. There’s probably more that I’m forgetting. Of course, I can’t get everything done, and I’m a little worried, with so much unstructured time, that I won’t even make a dent. They left at lunch time; this afternoon I’ve taken the car to the dealership (see previous post), picked up a friend’s share of fruit/vegetables from a local farm since they’re out of town, read 50 pages in my current book (The Devil in the White City), and did the final line edit on a short story that will be published on Sept 1. I’ve also half-started a gazillion other things, which doesn’t bode well. Oh, and listened to two and a half episodes of a marketing podcast. So I need to break things down and focus. Because who knows when I’ll get the chance again? Suggestions, Squiders? Anything I should do while I’m free? One of the things I’ve found interesting as I spend more time as an author and communicating with other authors is what left-brained organizational processes different people employ. This is an interesting tool, and I thought people might like to give it a look. Oh, Squiders. Let’s talk about cars. I have a 2011 Subaru Forester and, in general, I am very happy with it. In fact, I have been so happy with it that my sister-in-law, mother-in-law, and father have all gone out and bought Subarus since I got mine in December of 2010. I have just one major complaint. It’s a ridiculous complaint, in the great scheme of things. The car runs. It does not leak. It gets decent gas mileage. 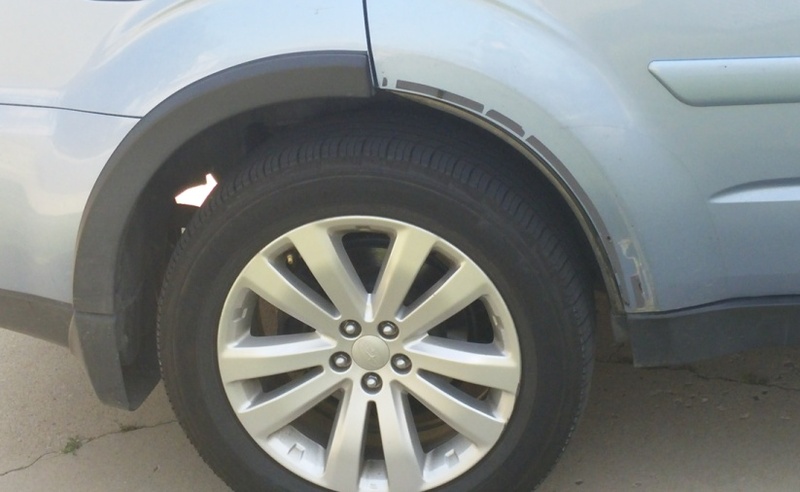 But my particular trim level came with these textured plastic trim pieces over the wheel wells. Supposed to make the car look nicer or something. However, they don’t stay on. I’ve had to take the car in over and over and over just to get them replaced when they fall off, which is invariably every six months or so. As you can see, the right rear one has fallen off again. For the second time this year. And, also as you can see, they leave behind sticky residue so it’s obvious that something was there that has gone missing. Ironically, the base model doesn’t have this madness, so I actually paid extra to be burdened with this inconvenience. I’ve already been in three times since January for trim replacement. And the last time, the idiot who checked me in didn’t actually listen to me, so I sat for two hours before they even touched my car because they thought I was picking the car up later. Still undecided on that point. Maybe I replace it yet again this time (it should be free, since it’s been less than a year since this piece last fell off), and I remove them the next time around. I can at least talk to someone about whether they would remove them for free (at this point, I’m wondering how much of it is technician error) and, if not, how much it would cost to free myself of this insanity permanently. Ever run into a similar problem, Squiders, where you’ve got a problem that is driving you insane through sheer repetitiveness? Recommendations on whether or not I should just pull the damn things off? If you’re like me, Squiders, (and I suspect you are to some extent) you have a ton of books sitting around, waiting to be read. Physical books, ebooks, books you were super excited for and yet have not touched, books your sister loaned to you over a year ago–books. Everywhere. The choice of what to read next can be overwhelming. Do you want funny or poignant? Scifi, fantasy, romance, mystery, or something else? New book? Classic? I think I’ve come up with a plan. I’m going to go shelf to shelf, left to right. I have three six-and-a-half-foot tall bookcases in my office, plus a fourth in the basement. I’m going to pick a book off the top, leftmost bookcase shelf, read it, then move down a shelf, and then again, until I finish that bookcase. One book per shelf, for now. And then on to the next bookcase. It’s completely arbitrary and weird, I admit. And it might not work, because I have my shelves vaguely organized (though mostly by size and not genre) and there might not be anything on a particular shelf that sounds good at that moment in time. But organization, even random organization, makes me feel like I’m accomplishing things. How do you tackle your TBR, Squiders? What do you think of my new system? Brilliant? Bizarre? At my current rate of 4 books a month, assuming I don’t read any library books or books I’m hoarding elsewhere (*cough*), it’ll take me 7 months to get through all four bookcases. I’d like to preface this by saying I did not pick this book out myself; my husband noticed it while paying for our bag o’ books and stuck in the bag because he thought it sounded ridiculous. Here’s the basic premise. Finn, almost 14, has recently been chosen by Disney to become one of their newest bits of technology for Disney World, a Disney Host Interactive, or DHI. The DHIs are holograms that walk around the park and help visitors out. However, now that the DHIs have been activated, Finn finds himself crossing over into his hologram self at night, where he meets an Imagineer named Wayne. Wayne tells him that the DHIs were created for a specific purpose, to be part human, part park attraction, in order to fight what he calls the Overtakers. Now, what an Overtaker is is a little muddy, but I think what it comes down to is that they are parts of the park (such as animatronic characters) that have started coming to life due to people’s beliefs. Because believing in something makes it real, you see. Normal people can’t see the Overtakers or some such (again, a bit unclear on this part, because it seems like even if it were animatronic pirates stealing cars from other rides, that that would be perfectly visible to all), so the DHIs are needed to fight them. The Overtakers, like their name implies, intend to take over the park, and eventually move on to the world beyond. However, some Overtakers can already be seen/interact with the normal world, which is where I am confused. Maybe someone else can read it and explain it to me. The prose is extremely clunky in bits, and it switches POV willy nilly (it’s almost always in Finn’s, but takes detours to tell you how other characters are feeling, or follows someone else if Finn is not currently interesting enough), but it does engage you, even though the premise is a bit silly and the plot points are confusing. I’d give it a 3 out of 5, I suppose. Not terrible, but would not read again, and it’s going to go in the Donate to Goodwill pile unless someone else in the household wants to read it. I suspect I am far from being the target demographic. My Google Fu tells me that there are now seven books in the series (of which this is the first) and a few short stories available. If this sounds interesting, you could be entrenched in Disney holograms for a few thousand pages. Stay tuned for more library book sale reading shenanigans! And remember to sign up here to get more fun stuff in your inbox! I learned something the other day that I’d never realized before. Before we get into this, watch this short clip from the Simpsons. Anyway, what I learned was that what we consider editing is not really editing. It’s really two separate processes: revision, and then editing. Technically, when we cut things and move things about to improve content, we are revising. And when we check grammar, spelling, and punctuation, we are editing. Now, this is admittedly nothing more than semantics. “Editing” has been expanded over the years to include most everything past the writing part of the process: revision, proofreading, and even formatting can be considered editing by publishing standards. But I admit that learning this gave me a bit of a start. How was it that I, a professional editor of many years, didn’t technically know this distinction? How many other editors are also unaware of it? It just goes to show that you can learn something new at any time. I know, at times, it can be easy to say that you know what you’re doing, that you’ve got nothing left to learn, and sometimes it can feel that way, when you see the same information over and over, but it’s always good to keep an open mind. After all, who knows what will be the next piece of information to rock your world? In other news, Squiders, I’ve set up an email list for anyone who’d like to get news about new stories I have available, when I have contests or sales going, other interesting things, and occasionally landsquid. (As a bonus, I’ll also offer subscribers a chance to join another list that can get you stories and stuff for free!) You can join by clicking “Get updates!” in the menu bar above, or by going here! Ah, Squiders, library book sales. Dangerous, dangerous things, aren’t they? One of our local ones, in celebration of Western Welcome Week, is having a week-long one where you can fill up an entire bag of books for $3. Three. Dollars. For a bag of books! And they had a ton of old scifi and fantasy, authors I’ve wanted to read but haven’t gotten to because my normal library system doesn’t have them and they’re out of print. I come from a family of bibliophiles, and our local book sale was called the Whale of a Book Sale (I mean, it still is, but I haven’t been in forever), and they would take over the main building at the local fair grounds and fill it with books. My sister and I would indiscriminately go through the entire bunch, grabbing whatever had a cool title or a neat cover. Dozens of books each. I am still reading books that I picked up as a kid. I read one last month, in fact. Of course, there are some who disapprove of such sales. These are the same people who dislike used book stores, because the author gets nothing from a resale of a book. The numbers don’t count toward their publishing record if they’re traditionally published and rely on such numbers to get their next book published. As an author, I can understand that view. It would be nice to be able to get more money each and every time someone else paid for one of my books. But, on the other hand, I really really enjoy hoarding books and being able to pick up new books and authors that I might not otherwise. I have read some really excellent books that I might not have touched otherwise. I mean, I have also read some really strange and/or otherwise horrible books. But most have been good. And the hope is, if someone picks up one of my books, I’ll gain a new fan too. Anyway, it might be fun to do a segment here on the blog about the library book sale books as I get through them. So look for that in the coming months. I’m reading Lost in a Good Book (Jasper Fforde) and The Martian (Andy Weir) at the moment and I think I’ll pick one of the new books up when I finish one of those. Do you love library book sales, Squiders? Can you control yourselves? Ever picked up anything really excellent at one?